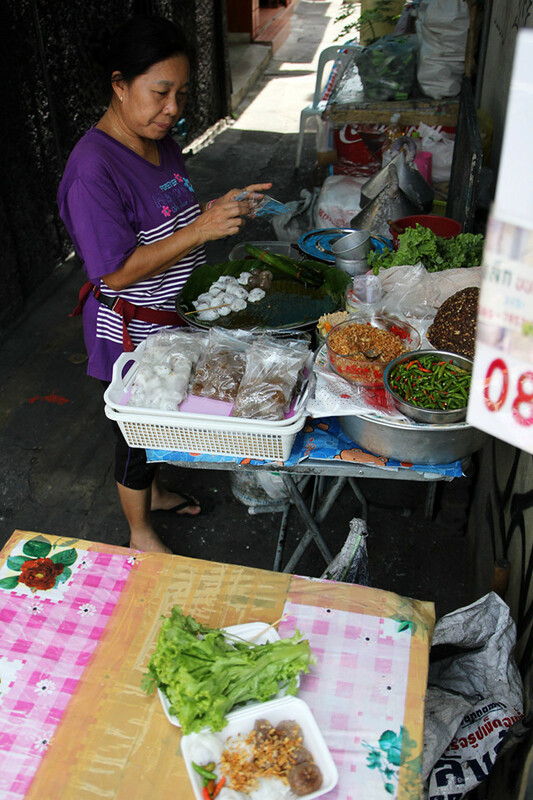 Khao kriap pak maw (ข้าวเกรียบปากหม้อ) and sakoo sai moo (สาคูใส้หมู), are two common Thai street food snacks. 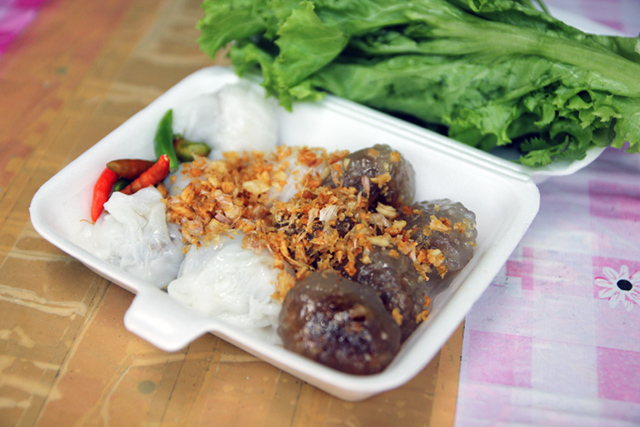 You’ll often see them being prepared at the same stall, mainly because they use the same filling but just have different wrappings. Both fall into that category of Thai snacks, somewhere between a dessert and a salty snack – you really can’t tell, it’s one of those extreme mixes of sweet and salty, and even spicy – ingredients that shouldn’t seem to go together. Some real character to this spot! 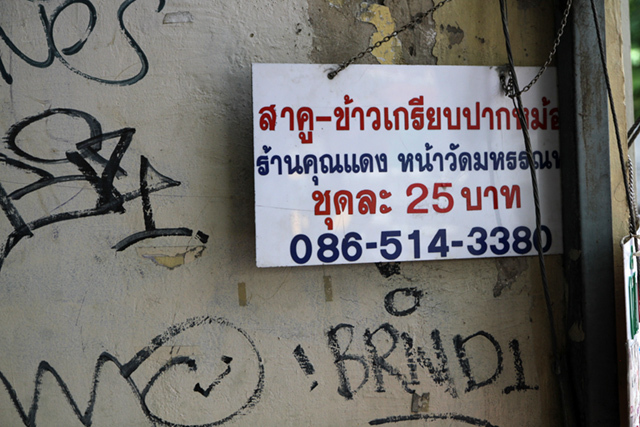 Hugging the side of the wall and slotted into a small motorbike alley, just off Thanon Tanao (not far from Khao San Road), is a friendly lady who sells both khao kriap pak maw (ข้าวเกรียบปากหม้อ) and sakoo sai moo (สาคูใส้หมู). However, you’ll find this same snack all over Bangkok, and I can’t say it tastes much different no matter where you try it. So if you see it on the street, just stop off and give it a try. 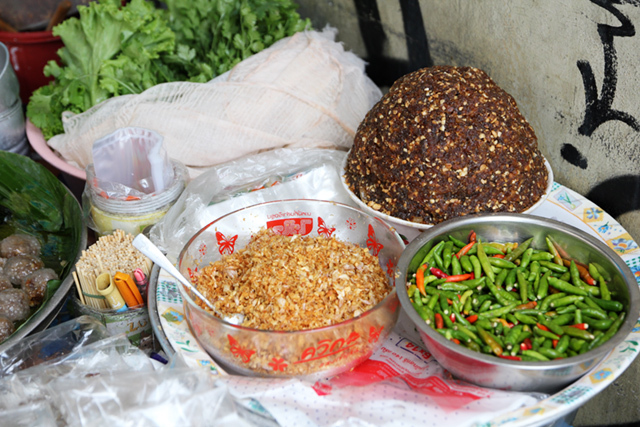 The two snacks are filled with a combination of minced pork, coriander roots, garlic, black pepper, peanuts, palm sugar, salt, oil, soy sauce, radish, and maybe some extra hints of spices, and each are wrapped in slightly different wrappings. That blob mountain of brown sticky ooky stuff is the filling! No, it’s not the most attractive thing you’ve ever seen, but it tastes a lot better once it’s steamed within a wrapper. For khao kriap pak maw (ข้าวเกรียบปากหม้อ) (not to be confused with khao kriap wow) the wrapper is made from a batter prepared from a mixture of tapioca starch and rice flour. Thin crepe like pancakes are steamed, and then some of the filling mixture is plopped on top before they are messily rolled up into a dumpling. 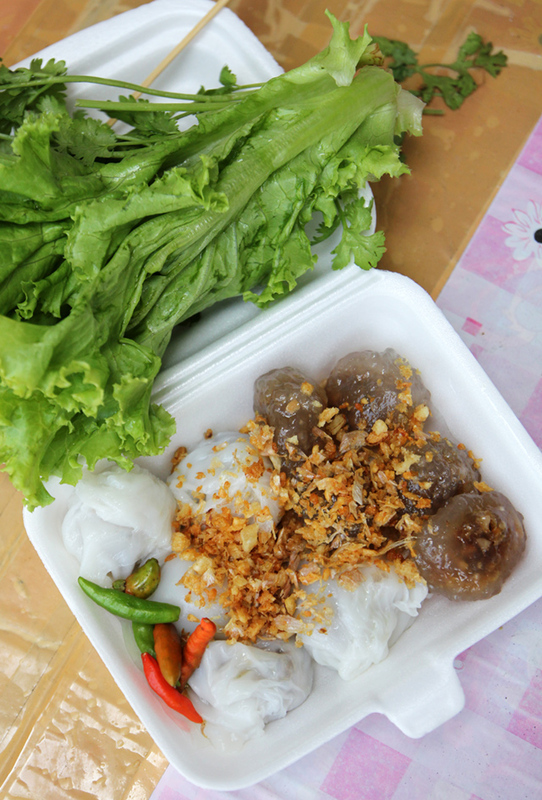 As for the sakoo sai moo (สาคูใส้หมู), the outer wrapping is made from tapioca pearls which are boiled down until sticky, formed into a wrapping, filled with the pork mixture, and then steamed in ball shape. 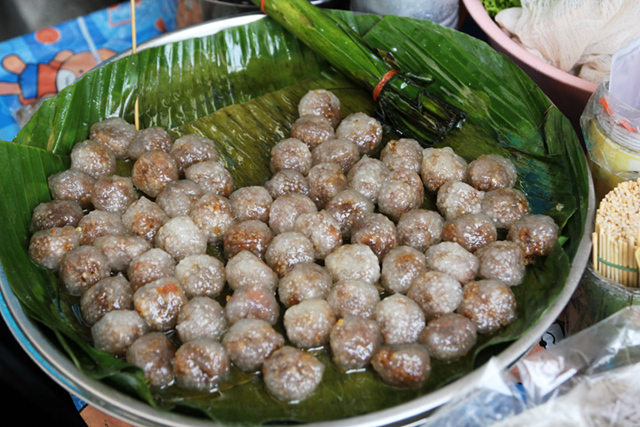 You’ll often seen sakoo sai moo (สาคูใส้หมู) sitting on a greasy banana leaf (like above) waiting to be ordered, looking like little meat balls. You can either order a mixture of both, if available, or you just get one or the other. I chose a mixed box, which comes with all the toppings and side goodies, known in Thai as a “chud (ชุด)” – a complete pack. When you make your order, the dumplings will be filled into a to-go container, topped with some freshly deep fried garlic, and served alongside fresh chilies, lettuce leaves, and often some extra herbs like cilantro. It’s sort of up to you how you want to eat your khao kriap pak maw (ข้าวเกรียบปากหม้อ) and sakoo sai moo (สาคูใส้หมู), but the common method usually involves grabbing a piece of lettuce, and sort of wrapping up one of the dumplings and chasing it down with a bite of chili. Khao kriap pak maw (the white ones, ข้าวเกรียบปากหม้อ), the outer wrapper kind of tastes like noodles, while the sakoo sai moo (transparent ones สาคูใส้หมู) taste more like sticky rice mochi. The filling is sweet porky and nutty, and then you get a hint of fried garlic, some freshness from the lettuce, and a hit of spice from the chili. I’m personally, not the biggest fan of both of these Thai street food snacks, they are a little on the sweet side for my liking. But that being said, they are unique and flavorful, such a diverse and contrasting flavor to them. Plus they look pretty cool being made! 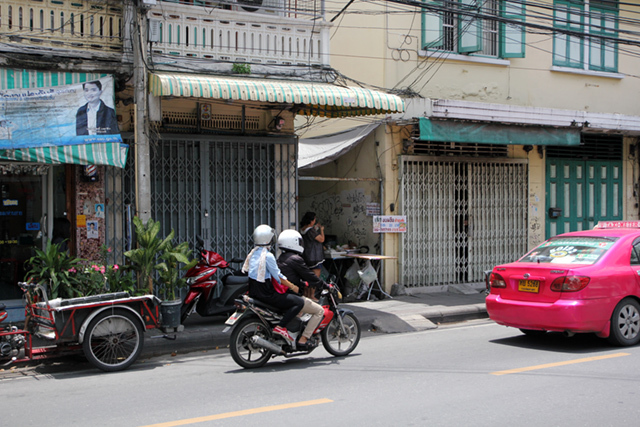 Within that little alley, you’ll find a vendor making khao kriap pak maw (ข้าวเกรียบปากหม้อ) and sakoo sai moo (สาคูใส้หมู), but really, you’ll find it all over Bangkok. 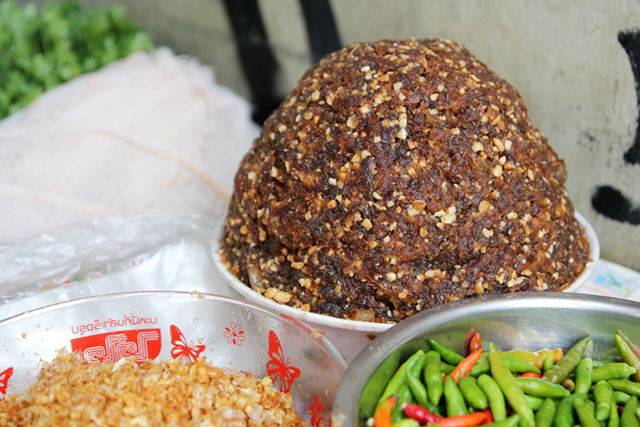 In meeting the rules and regulations of the US, what sort of machine would be ideal to make the khao kriap? You haven’t said what the ingredients are in the pork mixture? I tried sai moo luuat once and I’m assuming it is the same ingredient maybe? Hey Rich, good to hear from you, thank you! As for the pork mixture, I’m not totally sure as I’ve never made it, but I think it’s mostly minced pork, ground peanuts, onions, cilantro roots, palm sugar, and chilies. you know how pedantic Thai language can be and I didn’t understand สาคูใส้หมู. 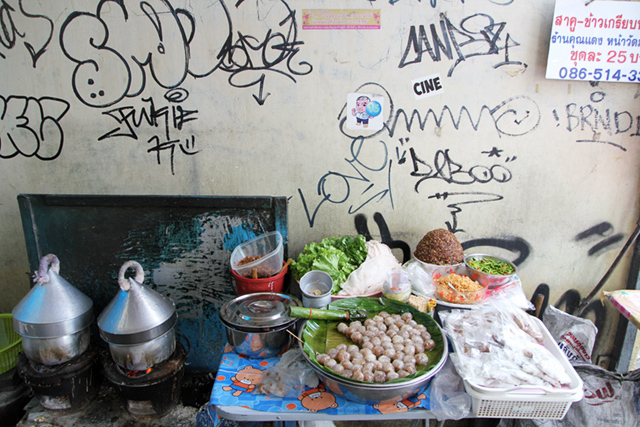 I would have spelt Sahkoo Sai Moo as สาคูไส้หมู and that would be pig intestine in sago – this is a new one on me btw and will be heading downtown to find some but wondered if you meant sakhoo moo or luuk chin sahkoo? Bear with me as my Parsar Thai is not very good..
Also, where did you find this dish?